As much as I hate to admit it, cleaning in my household sometimes follows that old mantra: out of sight, out of mind. But germs and allergy-causing irritants live everywhere, and it’s important for even the laziest of us to rid our homes of dirt, dust, and grime. Norovirus (the virus that causes the stomach flu) can survive on an uncleaned carpet for an ENTIRE MONTH, which is just…gross. While the toilet surface and bowl regularly get cleaned, we often forget that the base and back of the bowl exist. Make sure to mop behind the toilet regularly with a bleach solution; this helps greatly reduce the germs that fester on the bathroom floor. Neglecting to clean your dryer vents can be deadly. DUN DUN DUNNNN. The Consumer Product Safety Commission estimates that 15,000 fires occur each year due to obstructed airflow caused by lint build up in your dryer’s ducts. I personally know someone that has lost their home in a dryer fire. You probably already clean your dryer’s lint trap regularly, but in addition, follow this really great tutorial on wikiHow to learn how to clean your dryer vent. It’s recommended you do this at least twice a year. Moving furniture can be a pain, but anyone that’s moved their couch to find an errant remote knows just how disgusting it gets under there. Furniture sliders are available at your local hardware store or bed shop (these EZ Sliders are available at Bed Bath and Beyond), and help you glide heavy furniture over carpeted and hard surfaces alike, so you can regularly clean under even your heaviest couches. If you actually take a peek, dust gathers around air conditioner vents like crazy, and if you’re prone to allergies, can be a huge contributor to your non-stop sneezing. Twice a year, take 15 minutes to banish the dust: Real Simple shows us how to easily clean around air conditioner vents with a duster and extension pole. Dust accumulates like crazy on ceiling fans and cleaning your fan with a duster can be a huge pain, especially as the dust falls onto the floor below. Momtastic blogger Kimberly Michelle suggests slipping a pillow case over your fan blade, and then wiping off the dust as you remove it, rather than just using a duster. All of the dust will stay contained in the pillowcase! Creepy crawlies and dust like to live way up high where you can’t disturb them. To clean them, you will need a bucket, a mop, plastic garbage bags, goggles, hot clean water, and hot soapy water. 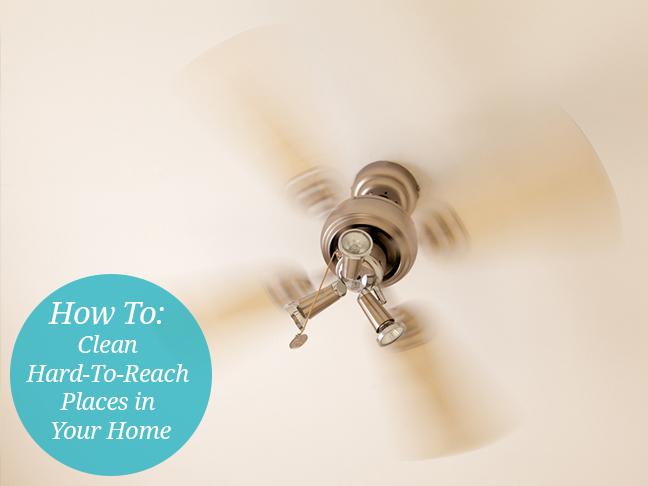 Follow this tutorial by CleaningTips.net to learn how to effectively clean the highest of places in your home. What hard to reach places do you neglect to clean? Got any great tips? Let us know in the comments.